Canyon Lake, CA – Residents of Canyon Lake recently witnessed the sixth application of alum to the main body, coves, and north causeway of the lake. With the support of the Lake Elsinore and Canyon Lake Total Maximum Daily Load (TMDL) Task Force that is seeking to significantly improve water quality and ecology in Canyon Lake, the applications have proven successful in minimizing algae growth. Being that Canyon Lake is located near the end of the watershed, it receives high levels of nutrients, such as nitrogen and phosphorus, as a result of water runoff. These nutrients encourage algae growth. By adding alum to the water, it immediately binds to the phosphorus, causing it to neutralize and become inactive. This process was chosen as a means to improve lake quality due to its proven effectiveness in lakes throughout the country. Recently, a 3-D model of the lake was developed to better capture the complex hydrodynamics and water quality observed. The study has been monitoring the effectiveness of the alum treatments since 2013. Recent results demonstrate that levels of phosphorus have been consistently lower in the main body of the lake following alum treatments, as compared to 2009-2012. Since 2000, the Lake Elsinore & San Jacinto Watersheds Authority has been conducting field studies, laboratory measurements and long-term computer simulations to provide new insights into the complex ecosystems and hydrology of the lake. In 2014, a two-day hydroacoustic survey was conducted to provide an assessment of the lake capacity. The survey illustrated that substantial sedimentation has lowered the capacity of the lake compared to 1993. The complex hydrology of Canyon Lake poses unique challenges in water quality and ecology management. Continued study and alum applications in the lake will take place in order to meet water quality targets. 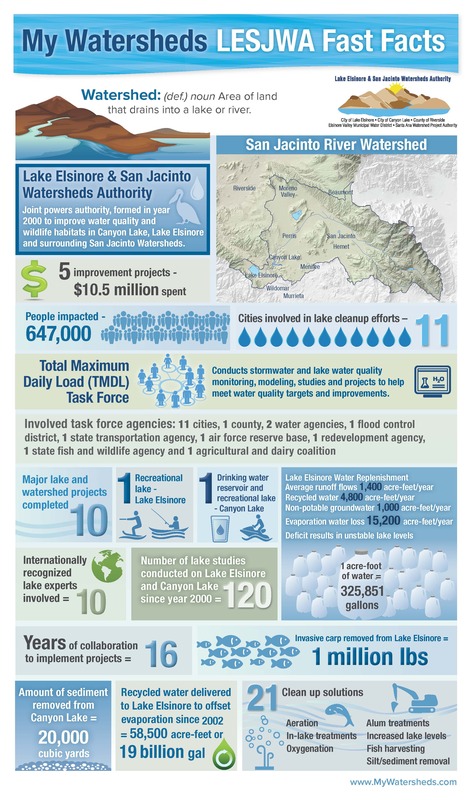 Funding for the alum applications has been provided by a State grant, the Santa Ana Watershed Project Authority – One Water One Watershed (OWOW), and by the Lake Elsinore and Canyon Lake Total Maximum Daily Load (TMDL) Task Force, which consists of cities, the County of Riverside, agriculture and dairy coalitions, and other organizations in the San Jacinto River watershed. Implementation of the alum project is being coordinated by the City of Canyon Lake, the Elsinore Valley Municipal Water District, LESJWA, the TMDL Task Force, and the Canyon Lake Property Owners Association. LESJWA is a joint powers authority entrusted with State and local funds to improve water quality and wildlife habitats in Lake Elsinore, Canyon Lake, and the surrounding San Jacinto watershed.